Michael Roy Roseberry, 67, died March 9, 2017, of a heart attack. 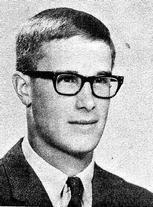 Mike was born in Billings on May 22, 1949, to Lyle and Virginia Roseberry. He graduated from West High and attended MSU. He worked in the oil business and construction. He enjoyed rock collecting, restoring his Model A and fishing. He is survived by his mother, Virginia Longo, his son, Michael Ross Roseberry, his sisters, Linda Baugh and Carol Rohr, and his good friend, Dawn Beckman. He will be missed.